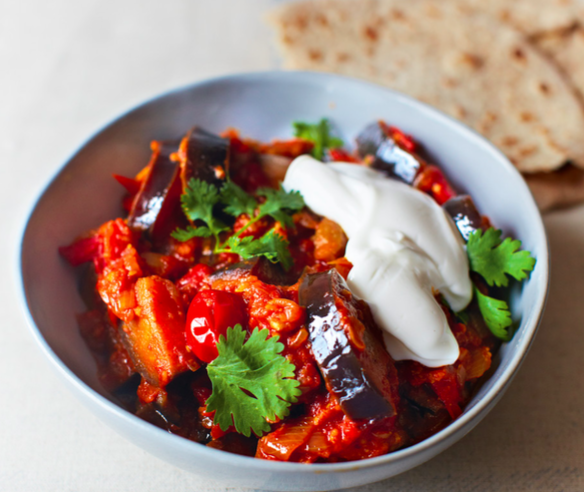 You can do all sorts of wonderful things with an aubergine, which is why an Indian kitchen is rarely without one. This aubergine curry was one of the first curries my mother ever taught me how to cook, and although I’ve adapted it slightly to include cherry tomatoes because I enjoy their sweetness, it’s still one of my most frequently cooked dishes during the week. Make sure you have some nice thick yoghurt on hand to eat with this curry, and some hot fluffy naans. Put the oil into a wide-bottomed, lidded frying pan on a medium heat. When it’s hot, add the onion and cook for 6 to 8 minutes, until soft, translucent and turning golden. Add the green chilli, the ginger and the garlic and cook for a further 3 to 4 minutes, stirring frequently, before adding the halved cherry tomatoes, then put the lid on the pan and wait for the tomatoes to soften (this should take around 10 minutes). Stir in the salt, turmeric, cumin, coriander, tomato purée and sugar. Mix together, and when the mixture is looking paste-like add 150ml of warm water, followed by the aubergine. Carefully coat the aubergine in the tomato mixture and pop the lid back on the pan. Cook for around 15 to 20 minutes, on a low to medium heat, until the aubergine is tender, falling apart and soft enough to cut with a wooden spoon. Check for spices and salt and adjust as necessary, then serve with a spoonful of yoghurt, a sprinkle of coriander and a pile of naans.